To change these statistics, education is the key. 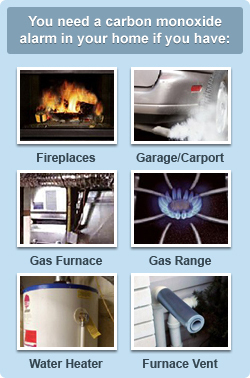 Appliances that use gas, oil, wood, coal or any other kind of fossil fuel produce carbon monoxide during combustion. Sources of CO in your home can include your furnace, water heater, wood stove, fireplace, oven and of course automotive exhaust. Normally these appliances are vented outside, but if there is a leak or poor installation, tragedy looms. Your ONLY protection is a CSA-approved carbon monoxide alarm. Remember… exposure to carbon monoxide reduces your ability to think clearly, so never delay if your CO alarm goes off or you sense there’s a problem. Get everyone out of the house and stay out, then call the fire department or 911. Exposure to carbon monoxide reduces your ability to think clearly, so never delay if your CO alarm goes off or you sense there's a problem. Get everyone out of the house and stay out, then call the fire department or 911.